Pattern is no longer available except via the Internet Archive, aka the “Wayback Machine”. What do Hagrid’s socks look like? Knit along and find out! This is a mystery sock pattern designed for the Hogwarts Sock Club by the Cocoa Beach Yarn Company. It is knit top-down with an easy-to-memorize pattern easy enough for a beginning sock knitter to knit. Clue #1 is the sock’s cuff. Clue #2 is the sock’s leg. The pattern includes both written directions and charts for the cuff’s stitch pattern. Pattern is currenty posted as separate clues (because this is a mystery sock-a-long for the Hogwarts Sock Club sponsored by the Cocoa Beach Yarn Company). Once the mystery sock-a-long is ended, the pattern will be posted as just one pattern instead of being posted in separate clues. 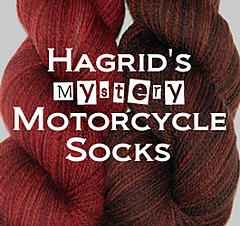 The clues can be downloaded for free - just click on the pictures for Hagrid’s Mystery Motorcycle Socks and the links are at the bottom of the page under “Accessories”. Pattern looks best in a solid or semi-solid yarn.